The L. E. "Gus" and Eva Shafer Memorial Art Gallery has been referred to as the "Gem of the Campus" at Barton Community College. The Shafer Gallery demonstrates the perseverance of a dream and a strong commitment to culture and arts. The late Gus Shafer grew up near Hoisington, Kansas and gained international prominence for his bronze sculptures. After a monetary donation from Art, Inc. in 1984, the BCCC Foundation began seeking major gifts for the building of an art gallery on campus. Mrs. Eva Shafer made an outright commitment and ground was broken on September 22, 1991. The grand opening was held November 1, 1992. The Gallery's roots date back to 1981, when Mrs. Faerie Denman of Great Bend donated the extensive 507-piece art collection that she and her husband Cedric, had acquired over the years. The collection, valued at more than $200,000, demanded proper storage and the means by which Barton could share the artwork with the community. 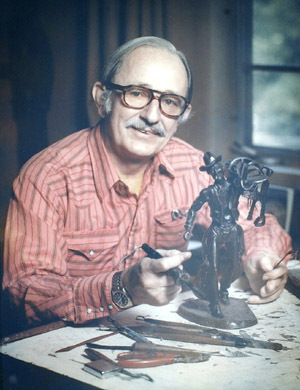 Now numbering more than 800 pieces, the Permanent Art Collection includes 28 of Shafer's bronzes and more than 100 works by Great Bend native Charles B. Rogers. The collection also contains masterpieces by such artistic giants as Chagall, Matisse, Picasso, Audubon, as well as many others. A son of the Kansas prairie, Leonard E. "Gus" Shafer was born January 23, 1907, on a farm southwest of Hoisington, Kansas. A farm hand named "Old Ben" taught him to hunt, trap and ride. Shafer felt that the influence of Old Ben and his grandfather caused him to have such interest in the Old West. While attending a small one-room schoolhouse, Shafer learned to draw. Following graduation from Hoisington High School in 1925, he attended Grinnell College in Iowa and Kansas State Teachers College, Emporia, Kan., where he met Eva. They were married in 1930 and moved to Kansas City where he worked for 38 years as a commercial artist. He sculpted his first model for casting in 1966 at the age of 59.